Excellent warmth-for-weight. 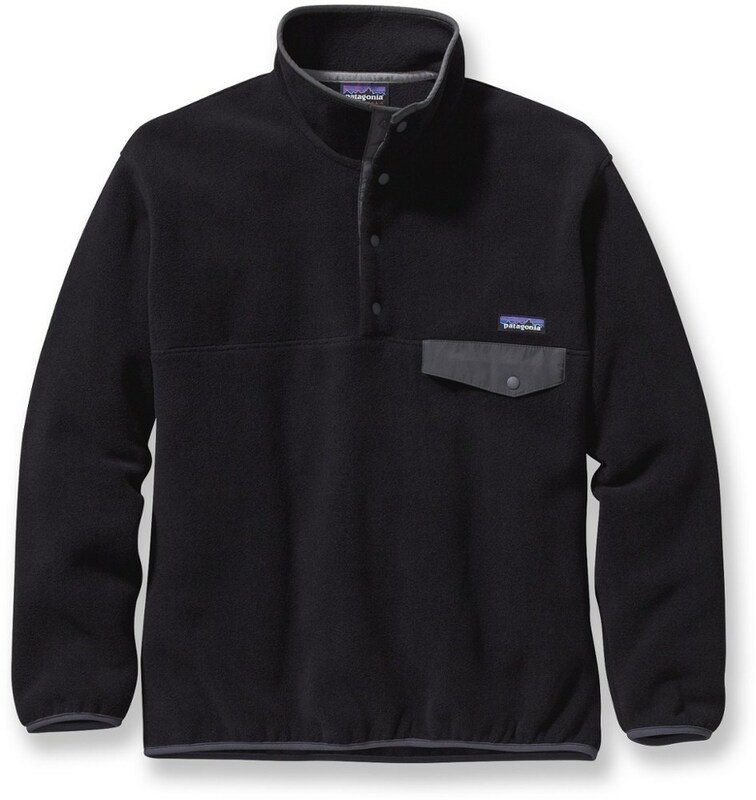 Ideal base-or-second-layer for cold weather. Superbly fitted high collar with slightly off-center zip at the top and flap behind zip: very comfortable and seals out any drafts. Seams at the wrist do have a tendency to get undone, but that happens often with this kind of garment and is very easy to stitch back. Pocket is of questionable usefulness; don't put anything there you wouldn't want to be damp... Can be practical for keeping something warm though (like spare batteries). I have the first one of these pullovers. 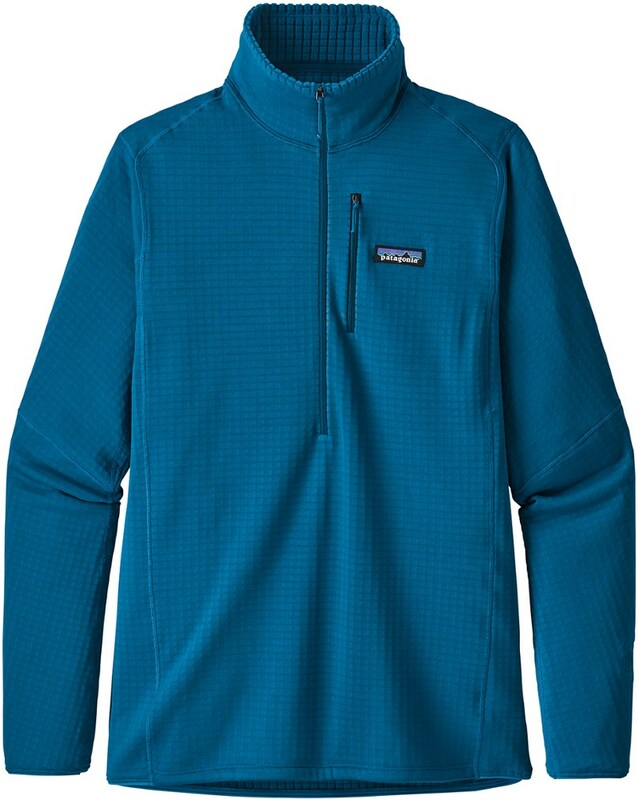 It is an excellent top, though a little snug for Patagonia sizing but this will probably vary in each design. Some of the stitching has come away, but power stretch is famous for tearing at the seams anyway. Other than that, a great product which has been used many many times and still looks ok (unlike other fleece which pills easily). It is not windproof, but it breathes and that is the point. 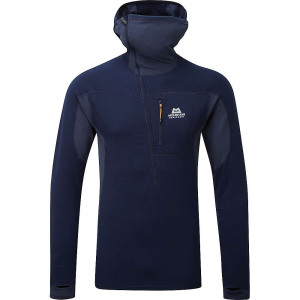 Good for most seasons: as a light fleece for under a heavy pack in winter; as a carried item for summer climbs when the temperature will drop up top; as an autumn fleece underneath a light windproof sweater. 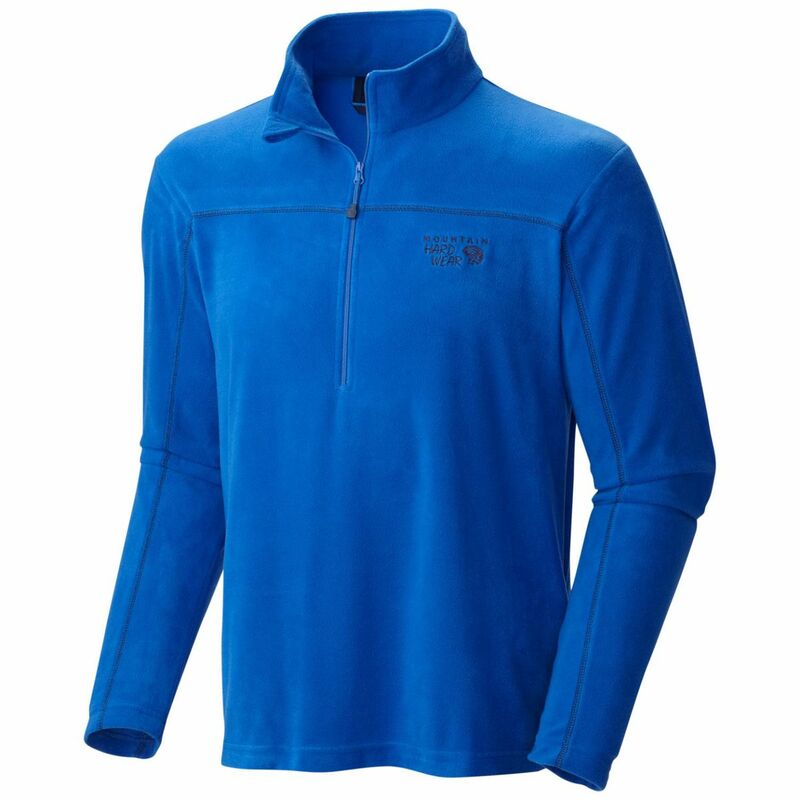 The pocket on a fleece top is essential, so bear this in mind when choosing a pullover. Also get a drop tail, or a long enough hem, as too many fashion fleeces have a stupid short hem, leaving bare flesh for the bugs, the wind, and a pack's hipbelt to abuse. My frog-green (“Kermit”) R1 pullover has been a regular part of my everyday kit for the last two years, and it is in my backpack as often as a water bottle, if not more so. Its versatility is unmatched by any other garment I own. The interior grid pattern is actually perfect for pajamas; I tend to wear it most often as a conventional baselayer, as well as a mid-layer. In each of these roles, the R1 shines. From an after-rain-shower warm-up to the foundation of a sub-zero layering system, I find I reach for the R1 more often than both my Cap 3 and R2 combined. Only in times of extremely high exertion, with a pack on, when wearing it as a baselayer, have I had the fabric “wet-out” to the point of compromised comfort, and even then it was only temporary; the pullover nearly wrings dry. Afterward, twist it ‘round your head like a helicopter for a few minutes while trying not to look like a Petey Pablo fan, and put it back on. It can be dry in an hour. The fabric is very high-loft for a baselayer, but it breathes incredibly well thanks to integrated “channels” running crosswise every ¼” or so. The resulting “islands” pull moisture away very efficiently, then spread it out onto the smooth face fabric via the interlacing channels. It stretches effortlessly, but never loses its shape, even after a couple weeks without a wash. The typical synthetic baselayer smell that develops after a few days without a wash does not appear in my R1 until well over a week; I think this also can be attributed to the breathability of the fabric and its ability to move moisture efficiently. As an insulating layer, the R1 is best employed in high-output activities like climbing or Nordic skiing; at rest, I begin to prefer my R2 in temperatures below 50F. Without a shell on, the breathability of the fabric limits its effectiveness in blocking wind, and in these capacities I would be wanting for more garment around 60F. It is an early version, as it is most definitely a slim cut. I’m 6’-1”, 160lbs, and a medium fits ideally. My notoriously long arms are fully sheathed in lovely Polartech no matter where I stretch, and the torso fits snugly. The length is perfect for my frame, but would likely be a bit long for someone under 5’10” or so. I can wear my Patagonia Cap 3 baselayer underneath with no issues, but then it does take a little tugging to get the R1 righted. The neck seals effectively by itself, and is not so tight as to inhibit my movement, even with the Cap 3 underneath. The neck is the exact same diameter of the neck on my size M, Cayanne R2, and indeed I cannot zip the neck of the R2 up at all when I’m wearing the R1 underneath. The zip on the neck goes down nearly to my belly button, providing deep ventilation when needed. For those who care, the backing tape on the neck zip is an infinitely deep blue/purple color, and it’s a great contrast to the variably-dyed green color of the main body. The breast pocket holds a couple bars or gels, headlamp and extra batteries, or the like. That said, I would not want more than a few ounces in the pocket were I going on a run with such a configuration, as the fabric will stretch enough to allow quite a bit of bounce by said ounces. All zippers are still smooth as silk, never having snagged once. Other bits of awesomeness include: swaths of Cap 4 fabric around the wrist, under the arm, and around the lower torso; a hang loop of 3/8” gross grain ribbon on the collar of the same exact blue/purple color as the zipper backing (pure Patagucci); a flap of R1 to overtop the zipper pull, thus hopefully preventing a frozen zipper if not an irritated chin. 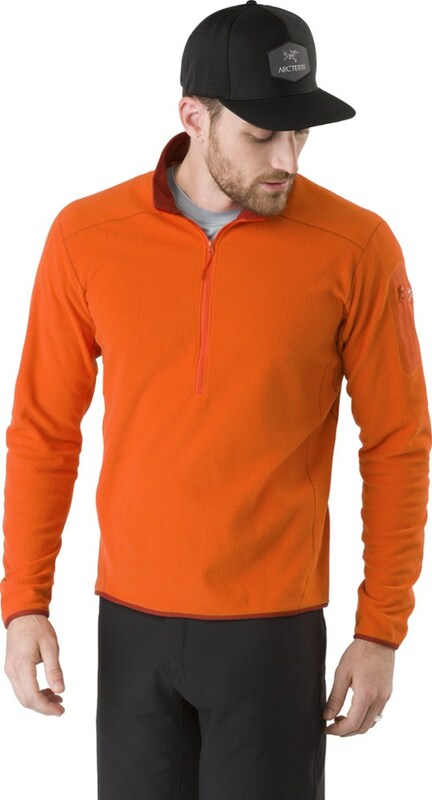 The Men's R1 Flash Pullover has been discontinued. 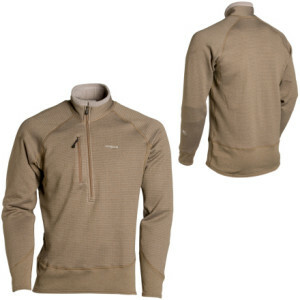 The Patagonia Men's R1 Flash Pullover is not available from the stores we monitor. 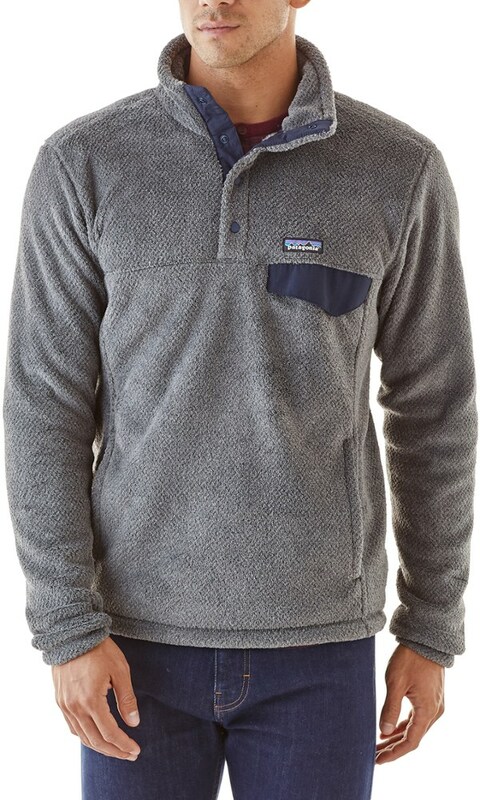 It was last seen January 15, 2013	at Mountain Gear.